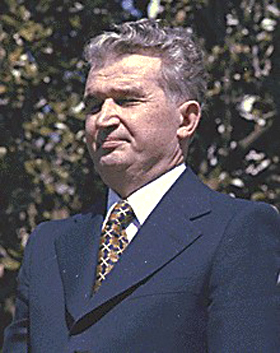 Nicolae Ceausescu was the stalinist Communist dictator of Romania from the late 1960s until his overthrow in 1989. He is most famous in the West for his totalitarian governance, personal extravagance, and for banning abortion in an effort to increase the Romanian population. After the fall of the Berlin Wall and the dissolution of Communism in Eastern Europe, Ceausescu was overthrown by a popular uprising. Within days of being overthrown, he and his wife were both executed by an impromptu military court on a wide variety of charges. This page was last modified on 6 March 2017, at 15:33.